Some places I visit are inherently sad. 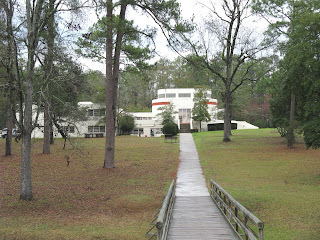 The former Cherokee capital at New Echota, Ga., is one those places. From there, 15,000 members of the Cherokee Nation started on their 800-mile march to Oklahoma, known to history as the Trail of Tears. The Cherokees were ripped from their homes without supplies, kept in disease-ridden camps before their move and forced to make the trip in winter, conditions under which more than 4,000 of them died. Gen. Charles Floyd sent a message on June 18, 1838, to his commander, Gen. Winfield Scott: "I have the pleasure to inform you that I am now fully convinced there is not an Indian within the limits of my command, except a few in my possession who will be sent to Ross’ Landing tomorrow. None can escape our troops. Georgia is ultimately in possession of Cherokee Country." Georgians had begun coveting the Cherokee land when gold was found there. As the pressure for more farmland grew, steps were taken to take possession. The Cherokee problems were taken to the U.S. Supreme Court, where Justice John Marshall said what was being done was illegal. President Andrew Jackson’s reaction was, "John Marshall has made his decision, now let him enforce it." It struck me as I toured the two state historic sites set up along the Trail of Tears that their development was an act of contrition, an apology for the earlier act of greed. Here was a group of native people who had taken on white ways, built log cabins, farmed, ran businesses, set up a printing press, translated books into their language and tried to fit in. A treaty was signed against the will of the majority to transfer to Oklahoma. Major Ridge, John Ridge and Elias Boudinot led the group of Cherokees who supported removal. 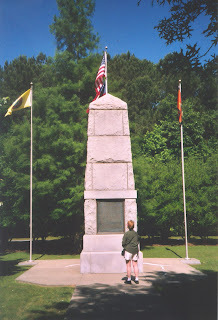 On June 22, 1839, all three were killed in retaliation for signing the treaty of New Echota. A lottery was set up, and the Cherokee nation was divided into lots, which included the homes of the residents. Lots were put into one barrel and the names of Georgians who wanted the land put in another and drawings were made. These transfers were made without the Cherokees’ knowledge. One day the new owner would arrive and take over. 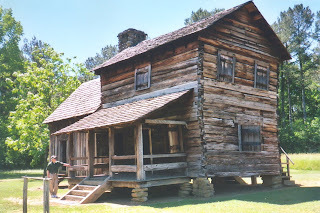 The more interesting of the two sites is the restoration of the Cherokee capital at New Echota, a short distance off Interstate 75 between Chattanooga, Tenn., and Atlanta. At the center there is a small museum with artifacts, stories and a 20-minute film giving background on the events leading up to the removal of the Cherokees. Only one of the original buildings is intact, but careful archeological research has located original sites and the buildings have been restored and furnished in period style. The most interesting to me was the print shop. The Cherokee had their own newspaper printed with the alphabet created by Sequoyah so his people could have "talking leaves." He is the only person known to have single-handedly created a written language. 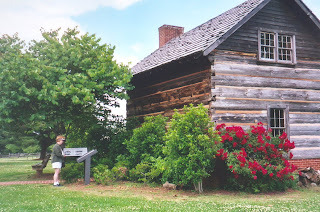 The Vann tavern reconstructed at New Echota, served travelers on the Federal Road as a restaurant, store, and inn. There were guest rooms on the second floor. The second site is the Vann house, 17 miles north on the Trail of Tears highway. It was owned by a Cherokee chief who became quite wealthy by knowing where the federal highway was going through the land and setting up businesses such as taverns and a ferry along the way. He also owned 110 slaves and had them make the bricks and the lumber for what in those days was a magnificent house. Here there is also a 20-minute background movie, a small museum and a guide who takes you through the period-furnished house and tells you the history of the Vann family. The Vann "estate" was like a small town. 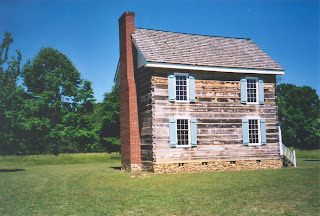 This log cabin stands beside the Chief Vann House. Both sites are in pleasant settings. I was there on a spring day when the weather was perfect. This gave me a feeling as to why there was so much resistance to moving to far-away Oklahoma. The National Museum of the American Indian is a work of art both inside and out. 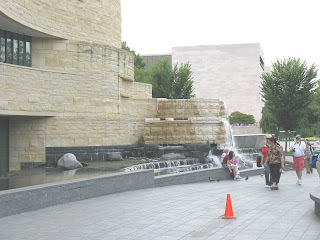 A visit to the National Museum of the American Indian in Washington, D.C., was a great experience for me in many ways. The façade itself is a work of art with its projections and curves rather than the square-box design of many of the surrounding buildings on the National Mall. Along the walkway to the building are a river, rapids, waterfalls and a swamp. The landscape has 25 native tree species and 150 species of plants including a crop area with corn, beans and squash. I was getting a feel for the American Indian story before I even entered the building. As I stepped inside my first response was, “This architect must have studied with Frank Lloyd Wright.” This is one eye-catching edifice. In actuality the building was designed by Douglas Cardinal, a Blackfoot, and a team of Native architects. At 254,000 square-feet the museum is an impressive size. Add to this marvelous setting great state-of-the-art media presentations and the intelligent use of exhibition space. Opened in 2004 the museum is a major addition to the already outstanding list of museums on the mall. This mostly successful attempt to relate history from an American Indian point of view gets complicated by the fact that there were hundreds of tribes, each with a story and theory of the cosmos. As a result I was flooded with so many images that I could not sort out a coherent picture of the American Indian. Instead I can only relate some of the pieces. A large wall map of the New World lights up sections showing how the diseases brought by Europeans decimated large numbers of Native Americans with smallpox, measles, cholera, and other illnesses that Europeans had developed defenses against. Clearly illustrated was the progression of these diseases that killed as much as 90 percent of the original population. A major visiting exhibition, Identity by Design, was on women’s dresses and their decorations. The bead designs and cuts of the leather varied from tribe to tribe making recognition easy. 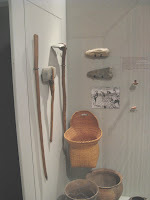 One section shows the process by which hides were turned into soft leather with a combination of props (such as an untreated deer skin) and a movie to demonstrate how a combination of deer brain, fat and lye were used to soften leather and then how smoke was used to complete the process. 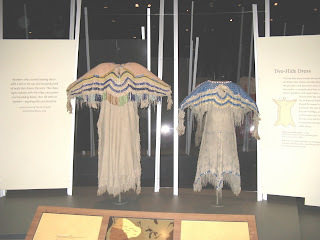 Several of the displays showed how skins could be turned into dresses in different ways, one, two and three skin dresses. 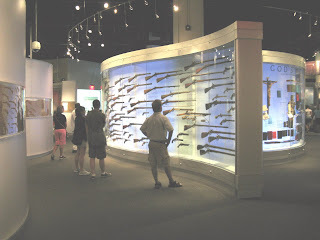 One wall was covered with guns used by Indians against the Whites from the flintlock through Sharps, Winchesters and Colts up to the automatic rifles used at Wounded Knee. 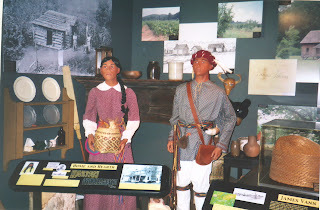 The Native American stories are told in these displays with movies, posed manikins, domestic items, photos, verbal recordings and at one stop 3D moving figures walking beside us. The displays are cleverly arranged so that each is separated and individuated from the others. It was always clear what tribe’s artifacts one was viewing. I took the hour-long highlights tour led by a woman of Cherokee and Creek background. At the end of the tour she told the real story leading to the Trail of Tears when her family was forced to move to Oklahoma, emphasizing that for too long the movies and books have told these stories from the White’s point of view. I had lunch at the Mitsitam Café that had at least seven different counters with native foods from different parts of the New World. I picked up a trout sandwich, wild rice, corn on cob and seafood soup from the Northwest Indians’ counter. Four floors of exhibits and several large screen movies are sufficient to make this a day-long adventure. LAWRENCE, Kan. - The U.S. government had noble intentions when it set up the United States Industrial Training School for American Indian children in 1884 in Lawrence, Kan. The goal was to remove American Indian children from their homes, train the boys in agricultural skills and the girls in homemaking tasks. The hopes were that this would turn them into fully assimilated Americans. 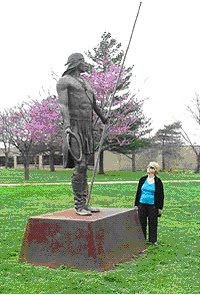 Haskell Indian Nations University in Lawrence, Kan., has gone from an institution that sought to assimilate American Indians into mainstream culture to one that seeks to preserve the cultures of various tribes. To accomplish this assimilation, they forbade the children to speak their native languages and prevented any contact with their families for four years. To the children, this kindly paternalism was more like being sent to prison. Others have referred to this as a form of cultural genocide. Carla and I were at the Haskell Cultural Center and Museum on the grounds of Haskell Indian Nations University in Lawrence. This small center provides the visitor an overview of the history of the university from its negative start to its growth into today’s small, modern college stressing American Indian culture. In 1970, the name was changed to Haskell Indian Junior College, and it began offering only college-level programs. In 1993, it became Haskell Indian Nations University. The week’s menu from the early years - the same every week - was posted at the cultural center. The students were fed a monotonous diet, with breakfasts mostly of mush and bread. Their daily schedule was like that of army recruits; they were marched to classes and meals and awakened and put to bed to the sound of bugles. The captive students had poor medical care, resulting in a higher-than-expected death rate. In retrospect, this attempt by the U.S. government to bring American Indians into the mainstream was a form of cultural cruelty. On our visits to other American Indian cultural centers around the country, we have yet to see any indication that any tribe saw it as a benefit. Haskell University has reversed this original policy of trying to get rid of differences and now seeks to preserve the cultures of various tribes. We enjoyed our walking tour of this campus of more than 900 students from 130 different American Indian tribes. The university is supported by the Bureau of Indian Affairs in the U.S. Department of the Interior. Students pay no tuition and a fee of only $215 a semester to cover housing and food. To be eligible for admission, students from most tribes must have one-quarter American Indian ancestry unless he or she is Cherokee, in which case one of the ancestors must be on a list created before the Trail of Tears. That means Cherokees need to have little American Indian DNA. Qualified students are taken on a first-apply, first-come basis. Buildings range from the 1898 Hiawatha Hall to recently built residential halls. Many of the buildings are from the 1950s. As we toured some of these buildings, we saw some striking American Indian murals, the American Indian Athletic Hall of Fame and some modern classrooms with state-of-the-art facilities. On our pass through the student newspaper area, we picked up copies of the most recent issues of The Indian Leader, "The Oldest Native American Student Newspaper Since 1887." Besides the sports stories, there were stories on alcoholism, diabetes, AIDS and mental illness, subjects of importance to the students. Majors are available at Haskell in American Indian Studies, Tribal Archives and Tribal Museum Management, environmental science, business administration and elementary education. The first two majors are a complete turnaround from the original goal of assimilation; the elementary education major is intended to improve education in American Indian schools by preparing teachers to instruct from a unique perspective. What is happening at Haskell now complies with the goals set by the Native American Congress on Indian Education in 1991: "Improved education for Native people will enable them to achieve equal political status within American society and will protect them against complete acculturation. Thus, only with this positive education will Native Americans be able to maintain their values while coexisting in mainstream society." A life sized group of indians are prepared to meet the Spanish new comers. My wife, Carla, and I are at the age when a drink from the Fountain of Youth sounds like a good idea. We were recently in St. Augustine, Fla., where the fountain has been doing a good business since Ponce de Leon first drank from it in 1513. We were not expecting the attraction to be very impressive and were surprised by how much we learned. We first visited the original spot where the fountain poured forth its water. It’s now capped, but we were given a small glass of the sulfur-infested water. The cheerful guide, who said he was 140 years old because he had to drink so much water each day to prove it was drinkable, gave a short lecture on de Leon. The Fountain of Youth room features two life-size dioramas: the Indian village and a scene of the Spanish coming ashore. De Leon and his men were greeted by a tribe of virtual giants, most of the men being more than 6 feet tall. Their strongly built leader was more than 7 feet tall. He would usually take the tallest woman in the tribe as his bride. This wouldn’t have been so interesting but for the fact that de Leon was the tallest of the Spanish soldiers on the trip and he was only 4 feet, 11 inches tall. No wonder the natives greeted them warmly. After all, in a world where size counted, these little people would have been hard to take seriously as any kind of threat. A misinterpretation of what the Indians said caused the Spaniards to believe this local spring was the fountain of youth. The average Spaniard died before the age of 40. They thought the chief of this tribe said he was 300 years old and that his father was still alive, albeit a bit decrepit. Regrettably, these magnificent specimens of good health and longevity did not have long to live because European diseases pretty much wiped them out. De Leon immediately had casks of the water loaded onto the ship for his personal use. Unfortunately, he died from an infection from a poisoned arrow in his leg as a result of encountering a tribe on the other coast, which wasn’t into friendly greetings of strangers in iron suits. Next we moved to the most unusual display I’ve seen recently: a giant globe of the Earth about 20 feet in diameter and brightly lit from the inside. As music from "Star Wars" played, the curtain opened to this glowing Earth against a starry background. The narrator told us of the initial voyages to the New World and also showed the sailing routes and the places where colonies were first established. From here we went to a planetarium with a ship’s mast amidst the projection machinery and were given an introduction to how sailors in Columbus’ day sailed by the stars. The rest of the attraction consisted of a building giving the history of the people who lived here with some very good discussion of how they lived, obtained their food and fought their wars. A grave had been discovered with many bodies of Indians who become Christians, and the Catholic Church formally re-interned them. We saw a marker near where de Leon came ashore and an archeological dig, covered when we were there, in which many artifacts have been found. The original fountain has been capped, but you can still get a drink of the water. The water didn’t do us any harm, and we did feel at least more intellectually stimulated as we left the grounds.